Following your awesome replies about the Moroccan Black Soap, I realised that I was short of an exfoliating tool to do it proper justice. I rifled through my beauty cupboard and pulled out these dubious-looking pair of gloves*. If you can for a moment, look past the luridness that screeches “I cost £1.00” they’re actually rather effective which makes me very happy that they only cost £1.00 afterall. They’re rough without being unbearably scratchy and although I’m sure they won’t last longer than a few weeks, it would be hygenic to replace them once a month anyway. I’m many things… but a dirt-bag, I’m not. Mostly. I tend to blitz my body in bursts of faux spa-related activity so these make a great pick-up for when I suddenly decide that tonight’s the night I’m gonna turn casa Lipglossiping into spa sanctuary Lipglossiping and take my rough bits in hand! I also recommend the similarly ugly and polka-dotted shower cap, it holds in heat very well making it great for hair treatments. Can’t remember how much I paid for the shower cap though, sorry! 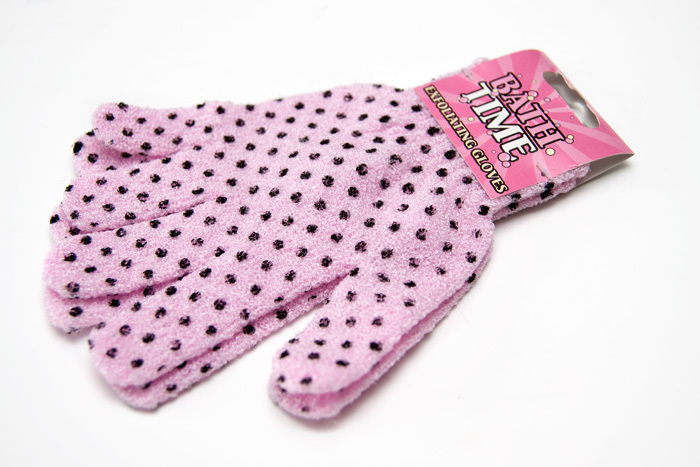 Wilkinsons “Bath Time” Exfoliating Gloves are priced at £1.00 and available to pick up in store. What are your favourite tools for recreating that in-home spa experience? oh i got some of these last xmas! they are very good but the soap and glory gloves are amazing! i got them in a gift set ages ago and keep re-buying them. try them if you get a chance! I’ve never seen exfoliating gloves. Obviously masks are my favorite when recreating a spa experience, but I also really like setting the radio to a spa station and burning a great candle. its saying duplicate comment but i can’t see what i wrote! i was saying i have some of these but the saop and glory version of these gloves are amazing! they exfoliate my skin really well and u should try them out! I wish I had known about these yesterday, was at wilkinsons (it’s miles away) and I could really do with a pair of inexpensive exfoliators! I have the shower caps of which you speak! Bought them a few days ago, one was pink and the other is blue. Will check out these gloves though, my Body Shop pair are on their last legs. I use a Dermalogica exfoliating cloth – I think the material is quite close to what I’ve seen gloves like that made from (the bodyshop’s version – though probably not all exfoliating gloves are the same), but a firmer weave and maybe slightly less rough? Allegedly it can last years, if you treat it well. I cannot abide the gloves – not because they aren’t effective, but because they are icky! Cold, wet cloth around your hands. Like showering with you clothes on. Bleurgh. Plus, another point in favour of the cloth – it is super long so it can reach around your back, which is really neat. I love exfoliating gloves, I find them far more effective than scrubs and you can use whatever shower gel you like. I initially thought they’d disintegrate in the same way that bath puffs do but they don’t! Mine are cheap ones too and they wash well in a 40 degree wash, so they can last years. I have The Body Shop exfoliating gloves, that I like to use WITH a body scub, not necessarily The Body Shop one. I’m with Catriona here, if you wash these frequently, they last for a long time. Those are some uber cute exfoliating gloves. I have some, but they’re not polka-dot! I have a pair from superdrug that were also about a quid and work great. I can’t see any need to spend a lot of money on them, the cheap ones work fine!